WE HAVE THE GROUP CAMPING AREA RESERVED SO THERE IS FREE CAMPING BOTH FRIDAY AND SATURDAY. The trails are a great mix of straw pine laces single track, winding downhills and fun CCC built rock stairs. When you are running towards the front of the park you will be climbing and coming back you will be descending so prepare for some vert. All runners must be on their last loop by 14 hours race time. The hard cutoff is 15 hours. No Pacers allowed for the race. Email race director for special consideration. The Start/Finish Area is at Mission San Francisco de los Tejas. #1 on the map. There is just one aid station at this race, and it is at the Start/Finish. 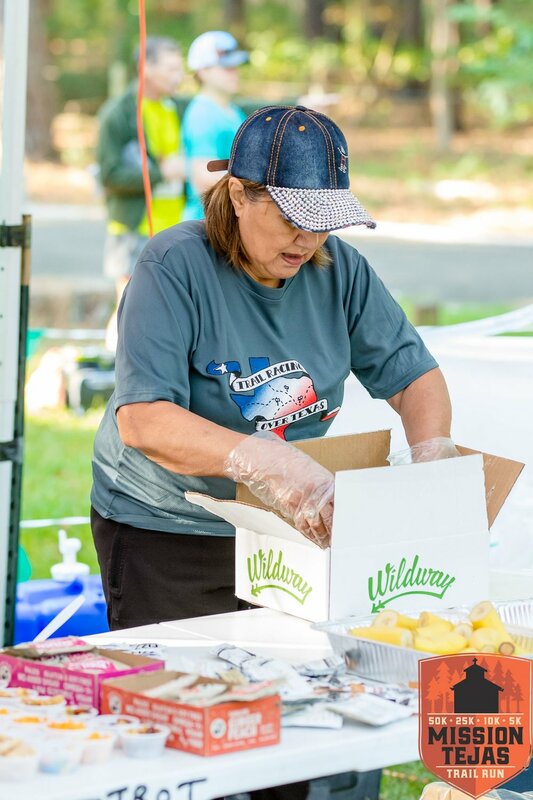 The aid station is a FULL AID STATION and will be full stocked with Texas Style Goodies. We will have parking inside of the park and may use an overflow lot as well. Latitude (degrees, minutes, seconds) N: 31° 32' 33.28"
Longitude (degrees, minutes, seconds) W: 95° 13' 55.56"
Mission Tejas State Park offers camping. For a hotel, you will have to drive about 30 min to Crockett or Rusk. We have rented the overnight group hall for primitive camping and tents. With the $5 for the event you can camp here for FREE. You will be park at the front of the park and we can shuttle you in. SO FREE CAMPING FRIDAY AND SATURDAY NIGHT. Top 3 Overall Men/Women in the 50k, 25k, 10k, and 5k. Top 2 Masters 50+ in the 50k, 25k, 10k and 5k. And every runner will get a shirt or race swag that they have chosen.